Villas, Apartments, Land, Businesses & Houses for Sale in Greece. 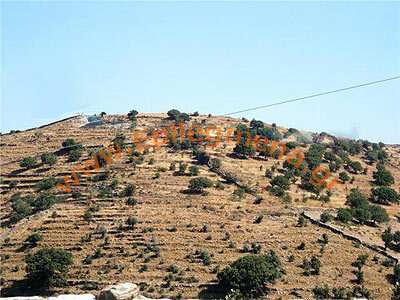 PROPERTY DESCRIPTION: KATO MERA, on elevation, with unlimited views to the sea and the beach of _Pisses_: Plot of land 25.000m2, with own well near by. 10_ drive to the beaches of Pisses and Koundouros. Suitable for residences and rooms to let. Kea or Tzia is the closest of the Cyclades to Athens. Kea has a land mass of 131 sq. km and a coastline of 81 km. Kea has a population of about 2,000. Kea is only 12 nautical miles from Cape Sounion. Kea is a mountainous island with small valleys and bays with sandy beaches. It is not a typical Cycladic island. It's very green with plenty of water, dairy farms, and fruit bearing trees. The local wine is recommended, as is the local honey, almonds, and lemons. The buildings aren't typical Cycladic, either, but instead look almost Tuscan, especially in Ioulis. See the map of the beaches in the map section below. The island is mountainous, with fertile valleys and excellent beaches. 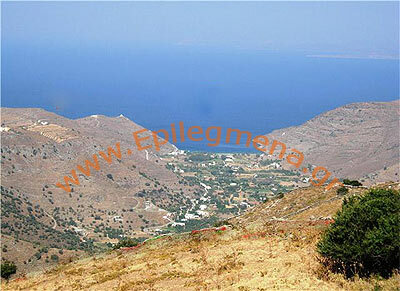 The capital of Kea is Ioulis and in the center of the island, 6 km from Kea's main harbor Korissa. Ioulis has red terra cotta tiled roofs and a winding maze of alleyways. Korissa is locally referred to as Livadi and islanders also refer to the island itself by Kea's older name Tzia. Kea is a quieter island than many Cyclades islands that cater to party goers. It is filled with families and has beaches suitable for families. Many Athenians come here regularly. There is camping at Pisses Beach. The harbor is a brisk and busy port. The bay has a decent sandy beach. There are a few pretty neoclassical buildings and a lovely church. Along the waterfront you can find boutiques, art galleries and tavernas. Over the headland, a path leads to the stone constructed estate of the Marouli Family and further along to the sandy cove sheltering Gialiskari beach with a taverna and pine stands. This locality has many holiday villas for rich Athenians. To the north lies Aghio Nicolaou Bay and the village-resort of Vourkari by the Sea where many yachts and pleasure boats loll in the waters. Voukari has several nice hotels, some with balconies opening on to the sea. There are also efficiency apartments for let. Try just about any restaurant for fresh seafood! You'll see the yachties eating near their moorings. At the northern most tip of the island is the very popular beach resort of Otzias. The bay around Otzias is ringed with blooming almond trees, which are beautiful in sping. You can walk up to the Monastery of Panagia Kastriani about a kilometer to the east. There's a great panoramic view from the monastery. The monastery has a miraculous Icon of the Virgin Mary whose properties were discovered in 1708 by two goatherds who were attracted to a mysterious glowing on the mountain side that led them to the icon. The trendy Ioulida or Hora is the hilltop capital of the island. Llike other Cycladic capitals, it's placed as far as possible from pirate attacks. The bus ride up the hill is filled with stunning views of the terraced hillsides and the sea. Ioulis has more windmills than any other island in the Cyclades: 26 stand on the Mountain of the Mills. Here a hilltop Acropolis and Temple to Apollo built by the ancients stood for over a millenia until 1210 when they were de-constructed by the Venetian Grandee Dominico Michelli who used the stone and marble to build a castle. You enter the Kastro quarter through a dazzling white archway. The castle was in its turn demolished by the Greek government in 1860 in order to put choice pieces in the museum mentioned above. On the site a Byzantine Church survives, as do two or three mansions of the Venetian nobility. There are oaks and country houses to the north of Ioulis. Above Perameria Town you will find sandy Spathi Bay. To the east of Ioulis are roads to three good beaches: Sykamia, Psili Ammos and Orkos. Five km south of Ioulis, the paved main road leads through rolling hills to a three story Hellenistic tower the focal point of the ruined Monastery of Aghia Marina. The ancient work has survived far better than the recent. From the monestary the road cuts over the west coast resort at Pisses. One of the island's finest beaches it at the resort area around Pisses. Like its neighboring harbor beach Koundouros to the south the beach at Pises is surrounded by trees and orchards. There are several smaller coves and bungalows for rent. Just past these is another winner of a beach at Liparo. There is good food in most Kea villages and towns. If you're seeking night life on this family-oriented island you can find it in Ioulis. In Korissia for dinner? Harbor side, try Kostas Taverna or The Faros (lighthouse). The up-scale Ouzerie Lagoudera is a nice change in its refurbished neo-classical house further along the Limani just past the periptero. The gavrous xydato is excellent. In Otzias, for down- to-earth good dining try Yiannis Fish Taverna on the shore road. In Ioulis, take advantage of the spectacular views and sup at The Ioulis on the main square or The Piatsa just thru the main archway. Other taverns of repute are To Steki or Argeeries, both noted for their traditional cuisine. In Pisses, try Polities (or the citizen) for good Greek food! Archeological finds show that Kea was inhabited well before 3000 BC and preceded both Minoan and Mycenaean cultures. Its inhabitants defended themselves with valor from the Minoan attempt at colonization on the peninsula of Aghia Irini but were eventually supplanted. Supposedly, Minos visited Kea and originated the Kean race with a local native named Dexithea. In classical times Kea was comprised of four settlements: Ioulis, Korissa, Polessa and Karthaea. The classical ear Keans worshiped Aristeos, a song of Apollo, who saved the Cyclades from the star Sirius. Famous sons of Kea include Bacchylides the lyric poet, Simonides the historian, the philosopher Ariston and the physician Erasistratos. Kea is also famous for its treatment of the elderly. In times of trouble people over 70 were forced to commit suicide by imbibing a hemlock-like poison in order to conserve food for the younger population. This practice is known as geroktonia. Keans say this only happened during the time the island was besieged by Athenians and food was scarce. The islands' watch-cat, the 6th BC Lion of Kea, or Leonda, basks in the sun about a ten minutes walk east of Ioulis. The lion is carved from a huge chunk of slate. This 2,400 year old smiling feline is 19 ft long and 10 ft high and carved from local stone. Cat lovers everywhere have long pondered as to its origin but its protective nature is undisputed. This is a cat with one long life instead of the usual nine. There are many island stories and tales about the lion. Only four hours from Athens, Kea is a popular destination with Athenians, so forget about accommodations on weekends unless booked well in advance.